Redwoods are the tallest trees on Earth and although once found over two million acres of northwest California they have been reduced by extensive logging during the last 150 years to various isolated patches all along the northern half of the coast, starting around the Monterey Peninsula south of San Francisco (the Big Basin Redwoods) and extending north into Oregon. 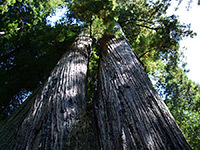 They grow in quite a narrow band, from the shore up to 30 miles inland, with the largest specimens usually found just a few miles from the ocean, where growing conditions are optimum - the redwood trees require moderate temperatures and high year-round water supply. 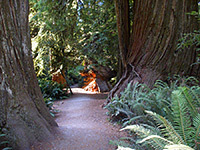 The latter is provided in winter by the frequent Pacific rain systems and in summer by the dense fog that covers the coast most mornings, conditions which besides the redwoods sustain other large trees - Douglas fir, oak and western hemlock, plus a great variety of bushes and ferns, creating a very dense forest parts of which have the greatest concentration of biomass (living matter) in the world. 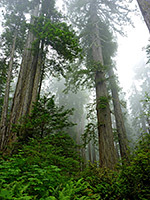 A number of isolated redwood groves are protected as state reserves and state parks (including Humboldt Redwoods), but the largest and most famous area is in the far northwest corner of California. In the 1920s, three separate regions became state parks (Del Norte, Jedediah Smith, Prairie Creek), then in 1968 various parts of the adjacent forest became Redwood National Park, creating a contiguous preserve stretching 50 miles from north to south. All four areas are now jointly administered by the NPS and the California Department of Parks and Recreation, and offer plenty to see apart from the forested slopes including narrow canyons, rivers, sandy beaches, coastal bluffs and wildlife viewing, elk being the most commonly observed large species. Wildflowers of Redwood National and State Parks - photographs and descriptions of flowering plants found in the region. Forest species are rather limited owing to the low light levels, but many more plants are found in coastal areas, some naturalized. Crescent City is the closest large town to the main section of Redwood National Park, just 3 miles from the edge of the trees along US 101, while the tiny settlement of Klamath also has one chain hotel. Towns serving the southern end of the park are Mckinleyville, Arcata, Eureka and Fortuna. where deposition of narrow sandbanks has created three large coastal lakes, good for fishing and bird watching. The national park begins just beyond, south of the small town of Orick, although most of its land lies either side of Redwood Creek and extends inland and about 10 miles south. 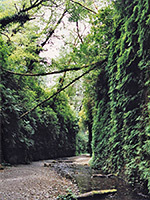 Next, US 101 passes the Prairie Creek Redwoods - the largest and most varied of the three state parks, this includes several miles of accessible beach and the nearby Fern Canyon, a beautiful sheer-walled ravine. Beyond, after another narrow section of the national park, the smaller Del Norte Coast Redwoods has more groves, on hills that slope down steeply to pristine but largely inaccessible shoreline, with just a few hiking trails. The northernmost region is the Jedediah Smith Redwoods State Park, adjacent to the Smith River and 5 miles from Crescent City. Activities here are concentrated around the river, with swimming, rafting, picnicking and hiking along its banks all popular in summer, but there are also some longer trails into the redwood forests that cover the hills to the south. 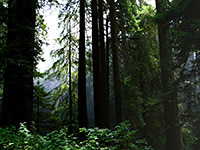 PDF format map of Redwood National and State Parks, from the National Park Service (512 kb).